Beauty, waxing, massage, nails, lash & brow studio. Leeds Dermalogica beauty salon and nail lash & brow studio. Urban Beauty wants you to feel good about yourself and we have an extensive range of massage, waxing, nail design, facial, and eye relief options, you can take advantage of to totally indulge yourself. Had a busy day? Call us for a luxurious massage. We can top it off with a therapeutic Indian Head Massage to put you right back on top. If you’re planning a party, we can tidy up your nails, give you a refreshing facial and finish up with a waxing for that extra feel-good factor. With experienced beauticians offering the very best beauty products and treatments you will be sure of an unforgettable experience. We will do our best to make your visit feel special. The salon is at Meanwood Corner, a buzzing residential hot-spot close to Headingley. A traditional Indian head massage to ease away tension, relax shoulders and neck area. It can also help promote hair growth and strengthen the hair. It helps to ease headaches and pains, insomnia and relieves stress. Learn how to apply makeup and learn which colours suit your skin tone. The lesson is arranged around your own personal needs and you will learn new tricks along the way. An intense lymphatic massage with the use of specific oils to help blast away cellulite on the body. A luxurious body massage with the use of hot oils for a deeper, more relaxing massage. Helps to ease stiff joints and pains and release tension. A deep cleansing mud wrap to tighten and tone the skin, remove toxins, to leave your skin feeling soft and supple. Also includes a full body polish to remove dead skin cells and promote cell renewal. This facial is designed for the more mature skin. Helps tighten and tone the skin, helping you to feel ten years younger. Includes superficial and deep cleanse, ex foliate, tone, mask and a deep-tissue massage. (A minimum course of 3 treatments is advised for maximum results). A specific, deep eye treatment to remove congestion around the eye area. Helps to reduce puffy, dark, tired eyes and helps the removal of lines and wrinkles. All facials are done using Dermalogica & Crystal Clear products and include a full skin mapping consultation. This treatment is a based on a chemical peel, minus the chemicals. An exfoliation heavy treatment, stripping your skin by 80%. This treatment will leave your skin feeling like new. Designed for those in a hurry. Includes cleanse, tone, moisturise and mini-massage. A facial designed for those with sensitive skin. Will help calm rosacea and help re-balance the skin in areas prone to irritation. This Facial combats adult acne and problematic skin caused by every day stress. A facial designed to brighten up dull,dehydrated, flat skin. Ideal for stressed,sallow complexions. This facial will brighten up and revitalise your skin to give you a healthy glow. A basic facial to suit every-day skin concerns. Using Dermalogica’s core skin range, this facial is suitable for those that want a refreshing pick me up and skin rejuvenation. A facial designed for teenagers. Will help to combat teenage problematic skin. This facial is designed for the more mature person, more time is spent around the eyes to help improve tone and aid lymph drainage. Please note: an allergy test must be carried out 24-28 hrs prior to the first treatment. An all-over massage to improve the body’s circulation and tone, to improve cellulite and lymphatic drainage. It also helps with insomnia and muscle flexibility, making you feel more relaxed. An intense deep tissue massage, designed for those with severe aches and pains, sports injuries or muscular problems. A relaxing back massage that helps relieve tension and general aches and pains that can build up through the day. A good way to relax. An intense back massage for those who suffer from back pain. Toxin release oil is used to help break down the build up of lactic acid. The treatment also includes ex-foliation and promotes cell renewal. The same as the Detox Massage but also includes hot paraffin wax for deeper massage. Beneficial for those with aches and pains as it helps ease stiff joints, rheumatism and arthritis. An all-over body ex-foliation to help remove dead skin cells. Includes nail analysis, file, cuticle work, buff, massage and polish. Same as standard manicure but also includes ex-foliation of hands and paraffin treatment. It helps to ease stiff joints, rheumatism, arthritis and dry hands. Includes full polish and nail art for Princesses under 10 yrs old. Includes foot and nail analysis, file, cuticle work, ex-foliation, removal of hard skin, massage and polish. Same as standard pedicure but also includes paraffin treatment for deeper massage. Beneficial for those with aches and pains in heels, lower legs and for those that suffer with cramps. An energising treatment, ideal if you go to the gym or if you are on your feet all day. Helps prevent muscle fatigue. Eyebrow, lip, cheek and chin. Underarm, standard bikini, half leg. Men’s Waxing – Please see Urban Man Prices. 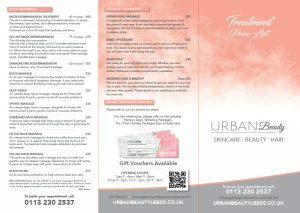 All treatments are available to Urban Man, please refer to main price list. Call now and book in with our Dermalogica skin specialists for your free skin mapping consultation. If you are tired of your skin feeling, dull, dehydrated, flat and flaky, we offer an in-depth Demalogica consultation. Using advanced facial skin mapping techniques we find your problems and help you get back to having the fabulous skin you deserve. Call 0113 230 2537 and book your Demaglogica appointment.